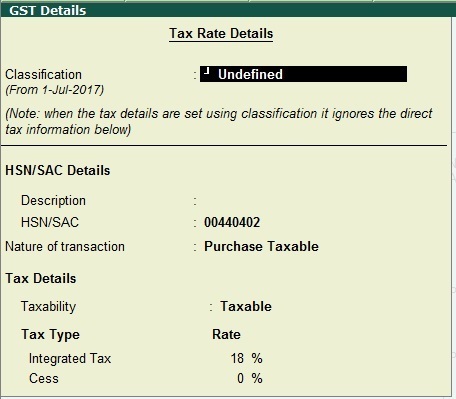 Home / GST-Tally / TallyERP.9 Lessons / How to Create Enable Reverse Charge Mechanism Purchase from Unregistered Dealers? How to Create Enable Reverse Charge Mechanism Purchase from Unregistered Dealers? Reverse Charge on Unregistered Dealer is very complicated issue in GST Regime. If you purchase Goods or Services from unregistered dealer then you have to pay GST from your own pocket on behalf of the Supplier. But do you know how to Enable Reverse Charge Mechanism for purchase transaction from unregistered dealers in TallyERP.9. We will resolve this issue in this tutorial. Select HSN/SAC Details to yes for appear HSN code for Purchase Ledger (default for all ledgers), Select type of Goods to No (If you select yes then this ledger should be convert into a non GST Item), Select yes to Enable Reverse Charge Mechanism. Now you are able to pass purchase entry from a Unregistered Dealer in Reverse Charge Mechanism. Hope you like this tutorial. In Next tutorial we know about How to Pass Purchase from unregistered dealer voucher entry with Reverse Charge Mechanism.